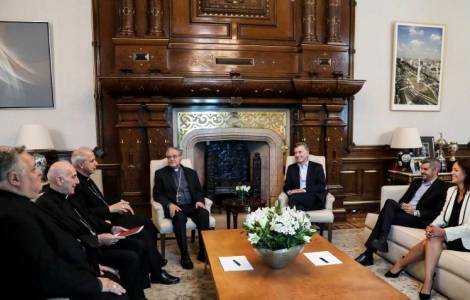 Buenos Aires (Agenzia Fides) - The concern of the Argentine Church for the social situation of the country and for the increase of "new divisions in society" was expressed by the Executive Commission of the Argentinian Episcopal Conference (CEA) to President Mauricio Macri, during the usual meeting to exchange Christmas greetings, which took place yesterday at the Government building. The meeting took place "in a climate of open dialogue, in which everyone expressed their ideas with sincerity and freedom", reports the CEA statement sent to Agenzia Fides. The Executive Commission of the CEA was formed by Mgr. Oscar Vicente Ojea, President, by Cardinal Mario Aurelio Poli, first vice-president, by Mgr. Marcelo Daniel Colombo, second vice president and by Mgr. Carlos Humberto Malfa, Secretary General. President Macri was accompanied by the head of the cabinet, Marcos Peña, by the minister of health and social action, Carolina Stanley, by the chancellor, Jorge Faurie and by Alfredo Abriani.